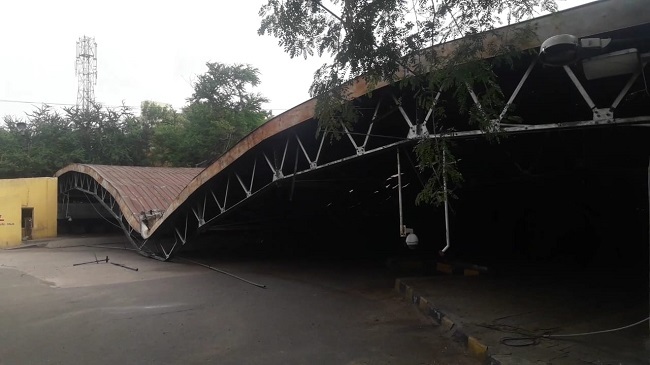 Why was Hyd's Gowliguda hangar allowed to collapse when it could have been restored? The failure of heritage laws, professionals and activists in bringing about a meaningful policy perspective is glaring. There are no prizes for guessing why the historic Gowliguda Hangar collapsed. However, why exactly the historic hangar was allowed to collapse is a question that begs to be asked. Lack of repair and sheer neglect have led to the collapse of the imposing structure which has been, for more than sixty years under the ownership, use, maintenance and management of the Road Transport Corporation. Under active use and in the control of a fully functioning organisation, why should any structure reach a state of collapse, and not be repaired by the establishment which has been engaged in vigorous building and expansion of its other properties, is a question that throws up alarming answers. What do the Heritage laws say? Heritage laws have failed Hyderabad in many ways, Gowliguda is just another case to lament and, at best, repent. It has not been included in the Heritage buildings list of the Hyderabad Urban Development Authority, which was scrapped by the Telangana government in 2015. The Telangana Heritage Bill of 2016, that heritage activists and professionals welcomed, is yet to become instrumental and notify its new list of heritage structures. Consequently, Hyderabad has no heritage regulations, whatsoever, as of date. The Hyderabad heritage buildings are at present, orphans with no department or agency responsible for their upkeep and care, and hence escaping from all blame. The Gowliguda hangar was unique and one of its kind in Hyderabad. Built in steel trusses, it represents 20th century industrial heritage. The structure, measuring 104 metres length by 48 metres width and rising to 14 metres height, provided a huge column free space below it, with a play of light and shade. It was a delight for architects and urban designers to visualise a whole range of possibilities that the gala space provided for adaptive reuse development. The hangar's location on the Musi river front, opened up opportunities galore for design and development. It could have been made a recreation space, an eco-park near Musi for tourists and visitors; a heritage gateway near the Charminar area, south of Musi, a heritage city in itself. It could have also housed exhibitions and melas, a counterpart in the older parts of Hyderabad, to what happens on Tank bund and Necklace road. The hangar has always been a pet site for architecture students and urban professionals who sharpened their creative skills and ideas working on design options. Could the hangar have been restored? The Gowliguda hangar qualified and deserved to be listed as heritage and restored. If it was listed, there would have been a move to bring in conservation specialists to restore the structure, following internationally laid down norms and methods of conservation. The structure of Gowliguda hangar is relatively easy and less tedious to repair and maintain than those historic structures built in brick, mortar and lime. The metal parts rusted or broken, can be restored, replaced or strengthened in bits and pieces. Heritage value apart, it was a structural system, a building in use by thousands of people every day - a subject and duty of the civil and maintenance engineers. The collapse, apparently, was not sudden. It was anticipated and the RTC management cordoned off the place and ensured that there was no loss of life. Why was there no attempt to curb the deterioration, why was the collapse not prevented, were there not periodic inspections are questions that are being raised, but in vain. Underlying this disaster is the total absence of a heritage perspective. It is now speculated widely that the historic structure was deliberately allowed to deteriorate and collapse, for rather obvious reasons as the old structure is occupying city centre, prime land that's perceived as stopping development and rolling projects. Reports of plans for a modern bus stand with state of the art facilities at the Gowliguda Hangar site, indicate a sense of jubilation among the officials rather than sorrow at the way a heritage structure collapsed. The former HUDA Heritage regulations had a very compelling clause, that in case a Listed heritage structure collapsed, the owners shall not be given permission to build any new structure, except reconstruction of the collapsed building. The site of Malwala Palace is still lying vacant near Charminar, just because of this rule. At the site of the bombed World Trade Centre in New York, a memorial was built, not just in memory of the lives lost, but also representing the place it was. What is even more saddening is the way we move on after shedding a few tears and, probably make a few statements in the heat of the moment. As one after another, heritage structures become memories, the failure of heritage laws, professionals and activists in bringing about a meaningful policy perspective becomes even more glaring. It is these feeble and ineffectual conditions that help authorities get away with delays and inaction in terms of heritage protection. In life and in death, the Gowliguda hangar site remains a land of design possibilities and development options. Though not an ideal stance as per the conservation paradigm, reconstruction of the hangar, in its old form, should be an option, retrieving original material where possible, but this time, creating a city public space. TSRTC should be made to answer questions and GHMC should not be allowed to permit any new structure which permanently erases the Gowliguda hangar from the cityscape and public memory. Vasanta Sobha Turaga is a conservation architect and urban-regional planner. Views expressed are personal.